After last year’s successful pilot in the Upper Division English Department, both the Middle and Upper Divisions have adopted Google Classroom! 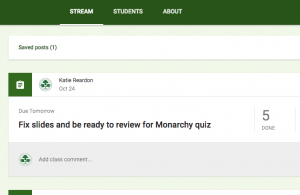 Google Classroom is a central site where teachers and students connect, track progress, and learn. In Grades IV through VIII, teachers are using Google Classroom to create a blended learning environment where students can participate in online discussions and share documents with their teachers. Science teacher Megan McLean recently worked with Elaine Hamilton, Engineering Design Coach, to create a google slides template for students to use to document their learning process in an electricity project. Google Classroom helps keep the collaborative work all in one place. Comment below! How is Google Classroom helping you?